And it’s a treat to have a guy like Jim on the podcast. He’s written Grant’s for 35 years. And in that time, he’s made some incredible calls (including first writing about the excesses in housing in 2001) and some not so incredible ones… But, most importantly, he’s amassed a cult following of the best and brightest in business and finance. Central bankers, Wall Street CEOs, hedge fund billionaires… they all read Jim. In our discussion, Jim and I talk about the current state of the economy, the latest Fed announcement and some of the insane excesses in the market today. And Jim sums of the absurdity of today’s market in one, important paradox. Finally, we share a few ideas on how to protect yourself and maybe even profit from these excesses. 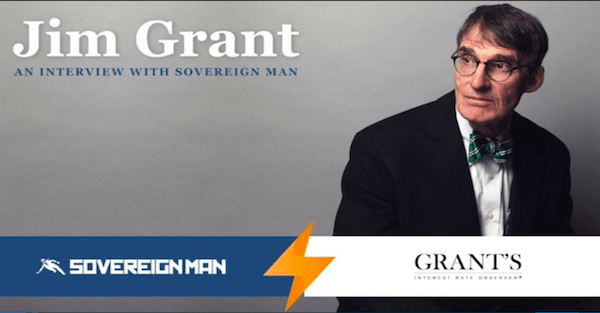 Also, at the end of our discussion, Jim shares a very special offer for Sovereign Man readers. And, you can listen to the podcast here.